These past few months, I mentioned several times that we were planning to renovate the bathroom which is a real eye-sore (you will see that I wasn’t joking in a few weeks). Unfortunately, we also had water damages just before last Summer. As we needed to take off the oak floorboards Steve and I had painfully glued twelve years ago, I thought it was time to make a few design changes to make the kitchen work better for us. So today, I’m going to take you through the first steps of this renovation project, what they involve and the mistakes I feel I made when I designed our kitchen twelve years ago. There will be also a small section about the renovations of our hallway which took place a few days later. Our previous kitchen was a single counter running against the wall and fitted with a SMEG hob, a SMEG oven and a dishwasher. The fridge was a large American stand-alone fridge (very similar to this one). We also had a vintage cupboard on the left-hand side of the room to store tableware. You can see very old pictures of the house when it was featured in Grand Designs in 2008 here and in The Telegraph in 2010 (my haircut!!!) and in French mag Côté Ouest in 2014.
Who remembers any of these old articles?? While not having any cupboards on the wall made the room breathe and suited my love for minimalist style, we lacked storage and the workstation was too small for the two of us preparing meals together in the kitchen. In addition, the three beautiful lights from Kathleen Hills we hung above the counter, were in fact not enough to light the whole room so we had to add this beach-inspired pendant light (which I’m selling now). – Not running the cooking credence from wall-to-wall. Mostly a design mistake but I think it would have looked a lot nicer. – Not planning the lighting design ahead but back then, this was a concept totally foreign to me. – Not enough storage and preparation space mostly because 12 years ago, I hardly cooked and therefore I made a lot of decisions based on whether it looked good rather than being practical. – Having cupboards with shelves (pain in the bum) rather than deep pan drawers, which are slightly more expensive but way more practical. – Steve being the Chef, also found cooking his back to our guests antisocial while being the Sous-Chef, I was mostly chopping veggies with a glass of wine nearby and chatting at the same time. – Last but not least, having a wooden counter (never again!) If you cook a lot, forget about wood! Renovating a house requires a lot of forward-thinking and our lack of experience a decade ago meant that we first fitted the kitchen units, then fitted the floorboard. This created a discrepancy level which proved to be a pain when we had to take the dishwasher out for repair. As my new kitchen design includes the addition of a second kitchen counter (where the fridge is, see photo #2), parallel to the existing one, we decided to move the door frame to the left. The builder first cut into the wall and was planning to reconstruct the wall on the right-hand side. However, when I came home, I loved so much how open and airy the kitchen felt that we decided to keep that wide doorframe which is now 1250 mm wide. Once the old concrete base is out, the Electrician comes in to run an electrical sheath to fit the cables for the upcoming hob on the new counter. It is on this floor that I took these lovely textured shots of my new leather slides. My mum and I dismantled the old kitchen and that night, I fell asleep as soon as my head hit the pillow. 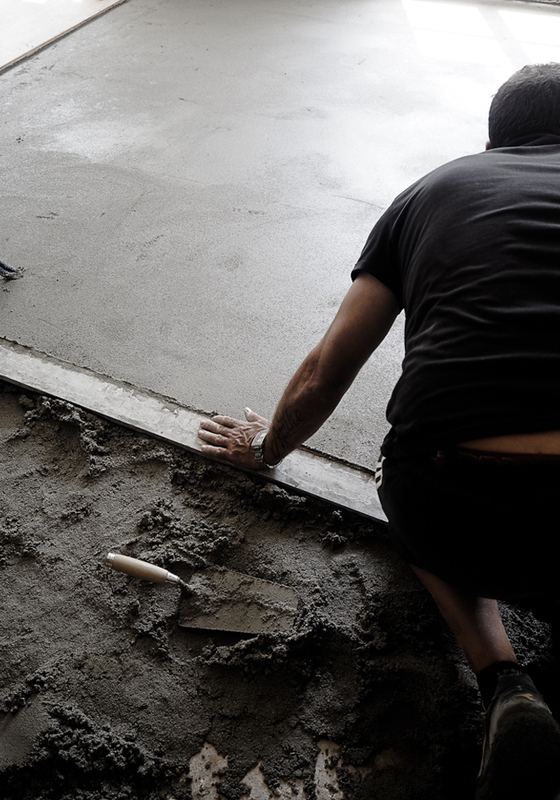 To take off the remaining flooring below the kitchen units and lay down a new cement screed. The kitchen will now be tiled on Monday and hopefully, we will receive the kitchen units on 19th June for a fitting on 22nd. Then it will take about 10 days for the company to prepare the Silestone worktop we have chosen (more of this later). The following week, we tackled the hallway. I had been looking for weeks for a builder who could re-plaster our entrance and hallway walls the traditional way rather than fitting plaster boards. As the builder who plastered our lounge a few months ago, had too much on, I was started to think that it wouldn’t happen until one I had been in touch with, called me back, came to the house on Monday and started on the spot. Our hallway/entrance is about 66m2. The idea was to replace the textured walls by a smooth finish for a modern look and re-paint the walls with a waterproof paint by Dulux Valentine in pure white which is the one I also used in our home in London. Our builder protected the floors thoroughly and started applying manually some coating to reduce the walls disparities. A lot of you thought he was projecting paint onto the walls…He wasn’t. He projected a mix made of powder and water, thinner than plaster, on the walls with his machine and smooth out the walls manually. He also filled up the holes in the door frame and tidied up everything nicely with clean lines. It’s a job that requires skills and strength. I’ve added several videos to my stories on Instagram (highlight RENOVATIONS) to show you the process but you can watch these below. The walls are now drying and we will start painting in a few days. I hope you found these pictures and process interesting or informative for your future renovations. Yes – thanks for showing us the process. Big job! I think I would have kept the wider doorway too – great idea and it’s going to look fabulous when it’s all finished. Looks gorgeous already, can’t wait to see the work progressing. Can I ask which Ikea kitchen you have chosen please? I’ve been looking at the Kungsbacka but it’s quite moody! We will have VOXTORP in a matte finish. It’s such an investment that I want it to last without going out of fashion and I’d rather add colour by painting a feature wall for instance. What an interesting post, I just read it from start to end your blog post, An informative blog. Thanks for sharing such a great post ever. Such a great word which you use in your article and article is amazing knowledge. Thank you for sharing it. I am very appreciate with your blog. Thanks!